We are celebrating our 17th anniversary! On 11 September 2000, ŽUSY s. r. o. (Žufánek and Sons) was incorporated. The objectives of the company were the manufacture and processing of fermentation alcohols (except for fruit spirits acquired through growers’ distillation). It was a leap into the abyss. Head-first, onto bare concrete. We could have easily hit the bottom. But we didn’t. The beginnings were difficult. 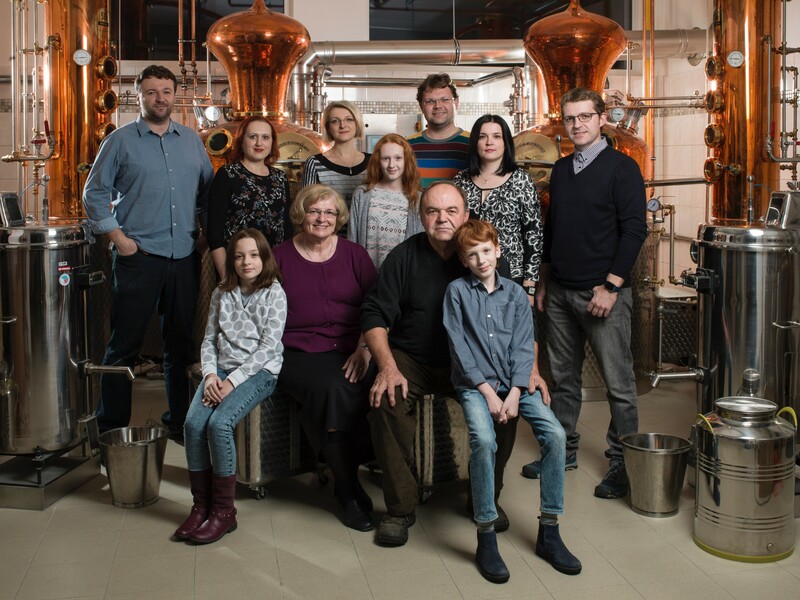 We distilled 700 litres of slivovitz during the first year, enough for two years of sales. Our second product was only introduced in 2003. We had to fill the bottles manually using a funnel, and in the winter, we transported the bottles from the cellar to the office on a sleigh. But I don’t want to revisit the past, our Chronicle serves this purpose. Browse it from the beginning, if you like. It’s amusing. There were five of us in the beginning. Three brothers and our parents. Then three brides came along. Then our first employee. Seventeen years later, our team has not changed. Just three new employees were added, and five little Žufáneks. Since the very start, only two people have been distilling, and we manage to do it this way even today. We still fall within the low surety category, so we are allowed to sell no more than 25,000 litres of absolute alcohol per annum. Even though we’ve come into the limelight, production has remained the same in recent years. We have a stable line of fruit spirits – without which, it just wouldn’t do. And thanks to their popularity, we have been able to distil experiments like our absinthe and gin – and this year, a new series of geists, unprecedented in the Czech Republic. We set ourselves a goal at the very start – to only produce what we would buy and drink with delight. Although we’ve reached breaking point several times, we never thought of making low-end substitutes like the infamous Tuzemák (Czech domestic rum), cheap vodka, blended slivovitz and similar “delicacies”. Sure, we could have sold pallet-loads of these, for a couple Euros a bottle, but would we be remembered for that? Does anyone remember the producers of hooch before the Czech methanol scandal? We’re looking forward, and not one step back! We’ll soon introduce the special packaging for our 15-year Slivovitz that we distilled in 2002… and now only 150 litres are left. But I will save the details for the next news item. It’s going to be big. Next week, we’ll come up with the fifth geist, and would like to distil another product of this series around Christmas. We do not intend to make new products in volumes similar to those of the slivovitz or absinth. We just want to toy with ideas and produce limited series of products for pleasure.